DOMESTIC GODDESSES: Back from such a fabulous trip! I’m back from three weeks of nonstop training in Johannesburg! Wow, it has been exhilarating, exhausting and exciting. I already miss the vibrancy of the people and the place and am busy planning my next trip up for October. I am almost fully booked already, so if any of my Joburg readers are keen for me to do some training, let me know soonest! 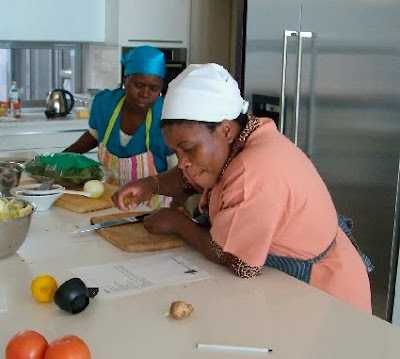 While I was in Joburg I trained mostly housekeepers (my fabulous Domestic Goddesses in the making!) but I also trained the son (and some of his friends) of one of my Cape Town clients. She was concerned that all he was surviving on up there was take-aways and wanted me to equip him with some basic cookery skills and a repertoire of quick and easy recipes. We had such fun and it really warmed my heart to see the enthusiasm and enjoyment of a bunch of young men getting involved in the kitchen. I also did a fun Saturday session with a group of women, planning and cooking a three course meal. Aside from the challenge of getting a group of excited women to all focus at the same time on one task, the day was so energizing and such a joy to be able to demystify cooking methods which can scare many people off. 1 – I LOVE Jourg and want to spend allot more time up there. 2 – It is almost impossible to find ground cumin or garam marsala in a regular supermarket. 3 – Shops mostly only open after 9am, very annoying for an early bird like me. 4 – The quality of fish available is amazing! 5 – Street lights are not a priority and make it hard to see speed bumps and curbs at night. Ouch! 6 – Saffron is more than twice as expensive and very hard to find. 7 – Most of the housekeepers I trained don’t eat pork and often not fish or seafood either. Very hard to train a recipe the person learning can’t taste. 8 – Almost no one seems to be aware that the cups and spoons you regularly use for eating and drinking with are often not the same volume as your 250ml measuring cup and your 5ml measuring teaspoon. 9 – No matter what the dial of your oven says the actual temperate of your oven can differ by up to 20C˚ either way. I now have an oven thermometer and measured every oven I worked with. 10 – It is seriously hard to find good coffee at the coffee shops in the Northern Suburbs. 11 – It feels like the group areas act is alive and well in the Western Cape. 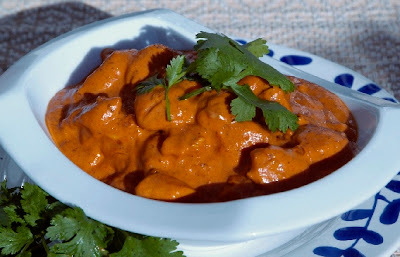 12 – My Butter Chicken recipe is such a WINNER!!! So quick, easy and delicious! 13 - Diletto online deli is great for thank you presents.